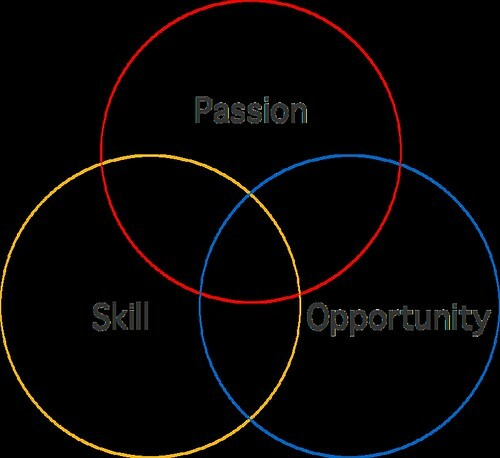 I've noticed that those that ultimately find satisfaction from their careers end up optimized for passion/skill/opportunity fit. They've been lucky enough to find the intersection of work they are passionate about, work they are skilled at, and work that has ample market opportunity. For those early in their careers or who have not yet found such satisfaction, I wanted to share how optimizing for passion/skill/opportunity fit can help you to ultimately find your dream job. Finding work you are passionate about is all about doing what you love. It's important to think about passion across two distinctive types. The first is passion for the cause. You want to believe in the mission of the work, you want the work to be deeply meaningful, and you want to feel like you're serving an important higher purpose. The second is passion for the day-to-day work. We spend most of our waking lives working so you want to make sure you enjoy the day-to-day activities you're doing in pursuit of the cause. It's important to have both types of passion because otherwise you could end up enjoying your day-to-day, but lacking meaning in your work or vice-versa, being incredibly passionate about the cause, but dislike what you spend most of your time doing. I'm a firm believer that you can't force yourself to be passionate about something, so finding your passion becomes a process of self-discovery. My best advice here is to constantly be self-reflective about the experiences you have in life and what aspects of them you enjoy or don't enjoy and leverage that knowledge to think about how that passion might translate into potential careers. Once you have this introspective engine going, it's time to increase and diversify your world experiences so as you might have an opportunity to stumble upon what you're ultimately most passionate about. You also need to find work that you can be skilled at to be great at that career. It's important here to distinguish skills that you can learn over time compared to required innate skills. Many roles do require you to have a minimal innate skill-level for you to have a shot at being great at that role. The stereotypical examples apply here: if you're poor in math, it's unlikely you'll be a great computer scientist or data scientist. If you're poor in writing, journalism is likely not for you. If you're not an organized person, you'd make a poor project manager. And so on. In contrast to that, to be great at many roles you'll need to also acquire and hone a set of skills over time. This is where deliberate practice comes in and focusing on pursuing 10,000 hours in a craft to reach true expert status at it. It becomes important to be able to identify what these acquirable skills are for you to be great at the role and put yourself on an accelerated path to learning them as quickly as possible. The distinction between acquirable and innate skills is what folks struggle most with here. It's because nothing is ever truly limited to being innate. We can all get better at math, writing, and staying organized, for example, so they can feel like they are also acquirable skills. One litmus test to use to distinguish is trying to determine how much time & effort it would take you to be above average with the skill-set. To the extent it feels prohibitively expensive, it may not be the right skill fit for you. Lastly, you want to find work for which there is ample market opportunity. Struggling to find work to make ends meet is obviously not a formula for career success. At the same maximizing your career simply for salary is also not going to improve your career satisfaction, as research shows that salaries above $75K don't provide any incremental happiness. So this really becomes an exercise in ensuring there is sufficient available roles within your career. Emergent opportunity is also worthwhile to explore as the nature of work is constantly changing. In the tech world, we've seen the rise for the need for software engineers, interaction designers, data scientists, growth hackers, analytical marketers, and so much more which has created a vast amount of opportunities for those who can acquire these newly minted skills. The task for finding your dream job then becomes finding the intersection of work that you are passionate about, skilled at, and has ample market opportunity. The intersection of all three is what is most important. Being passionate about something but not having the requisite skills won't lead to career satisfaction. I think most folks generally understand that trade-off. For those early in their career I find the following trade-off is a harder lesson to learn: finding a very high-paying job which has clear market opportunity but for which you have no passion will also ultimately not lead to ultimate career satisfaction. It's thus important to find the career that intersects all three fits. The specific weight you should put on each of these three dimensions is really a personal choice. Oftentimes optimizing for stronger passion fit over opportunity fit makes sense for an individual. For others opportunity fit is very important given the needs of supporting their family. But always remember that completely sacrificing one dimension for another will make it difficult to ultimately find your dream job. Who’s in Your Draft Pick?